A recent market study published by the company “Dental Laser Market: Global Industry Analysis 2013–2017 & Forecast 2018–2026” consists a comprehensive assessment of the most important market dynamics. On conducting a thorough research on the historic as well as current growth parameters of the dental lasers market, growth prospects of the market are obtained with maximum precision. The report features unique and salient factors that may make a huge impact on the development of the dental laser market during the forecast period. It can help market players to modify their manufacturing and marketing strategies to envisage maximum growth in the dental laser market in the upcoming years. The report provides detailed information about the current and future growth prospects of the dental laser market in the most comprehensive way for the better understanding of readers. The prevalence of gum-related diseases is increasing. Nearly one-third of all the adults, i.e., 1 out of 5 children in the U.S. suffer from untreated tooth decay. Tooth decay can be treated with laser devices, which are minimally invasive and lead to less pain. According to CDC more than 60 million people in the U.S. are suffering from gum diseases and risk of oral systemic connection. New techniques are designed that reduce the usage of drills and avoid the usage of anesthesia. They provide successful long-term outcomes as no heat is involved during the treatment and there is no damage to the living tissues. The lasers improve the soft tissue treatments, reduce inflammation, and enhance the tissue repair process. Increased incidence and demand for minimal invasive procedures is projected to boost the global demand for dental lasers. The increasing screening rates as well as geriatric population are the critical drivers of the dental lasers market. Approximately, 32% of the world’s population aged 65 and above is edentulous. According to estimates of the German Oral Health Study, 12% of the population between 65 and 75 years have lost their teeth. Thus, the growing elderly population is an important factor expected to drive the growth of the dental laser market during the forecast period. People aged above 60 years are at a high risk of developing dental disorders. According to the Center for Disease Control and Prevention, almost 27% adults in the U.S. suffer from tooth decay and 46% of adults aged 30 years or older suffer from gum diseases. The per capita spending on health care is increasing worldwide, which is directly expected to boost the growth of the healthcare sector and subsequently, the medical device industry in the near future. It has also been documented that the global per capita health care spending has almost doubled. Rapid economic growth and increasing disposable income are expected to the prime factors responsible for the growth of the overall healthcare industry. The Global Health Observatory Data reflected that healthcare expenditures accounted for 10.0% of the gross domestic product of the economies on an average in 2013. Increasing healthcare spending is expected to directly impact the need for better dental treatment, which, in turn, is expected to create high growth opportunities for the players operating in the global dental laser market over the forecast period. As per the World Health Organization (WHO), about US$ 1,058.0 per capita was spent on health expenditure in 2014 worldwide. Increasing approvals for dental lasers by FDA and other agencies has generated a lot of market enthusiasm. Over the last few years, leading players in the laser equipment segment of the dental lasers market have received regulatory approvals across major geographic markets, which has enabled them to launch various products in the market. For instance, in February 2017, BIOLASE’s new Waterlase Express Er,Cr:YSGG all-tissue laser system received FDA clearance for its commercial distribution. Advancement in technology have widened the laser applications in endodontics and orthodontics. Various types of lasers are used in repairing the porosity of the teeth, welding of implants, repairing of broken clasps and for whitening of the teeth. For example, Er:YAG lasers are used an a substitute for acid etching of enamel. Laser etching is painless and does not involve either vibration or heat. Moreover, the easy handling of the apparatus makes the treatment highly attractive for usage. Also, as the technique is effective it will further reduce the fear in pediatric patients. Furthermore, growing awareness is expected to surge the demand for dental lasers and the drive growth of the market. The competition section of the report features profiles of key players operating in the dental lasers market based on their market shares, differential strategies, product offerings, marketing approach and company dashboard. Examples of some of the key players operating in the dental lasers market include Biolase, Inc., Dentsply Sirona, AMD LASERS, A.R.C. Laser GmbH, Convergent Dental, IPG Photonics Corporation., Elexxion AG., Laserstar Technology, Denmat Fotona D.D, J. MORITA CORP., and Den-Mat Holdings LLC, among others. Dental lasers are intended specifically for oral surgery or dentistry. Dental lasers are used for a range of dental treatments such as crown and bridge cases, implants and implant-borne restorations, orthodontics, as well as removable. These devices are the substitutes to conventional soldering systems. The dental lasers assist the dentists in reconstruction and fabrication for common dental prosthetic connections and make welding easy. FMI conducted a research study on dental lasers market for the forecast period 2018 to 2022. The report offers a comprehensive evaluation of the business opportunities prevailing in the dental lasers market along with insights on the dental lasers consumption trend, disease incidences, and awareness level for dental lasers market competition. The report elaborates the macroeconomic factors influencing the dynamics of dental lasers market and its futuristic potential. The report offers a comprehensive taxonomy of dental lasers market based on product type, end users and region. The product type segment of the dental lasers market includes dental surgical lasers and dental welding lasers. The end users segment of the dental lasers market includes dental clinics, hospitals and ambulatory surgical centers. 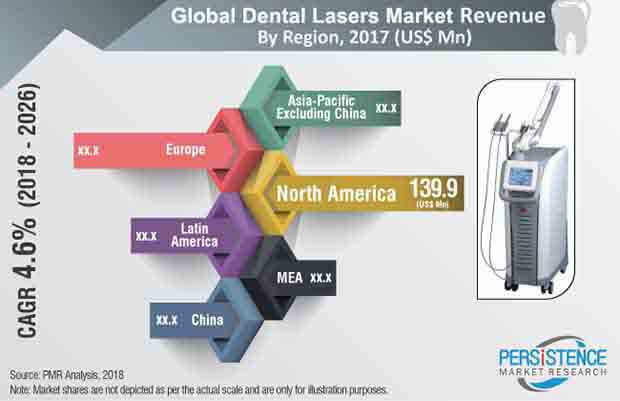 The dental lasers market has been analyzed across regions of North America, Latin America, Europe, Asia Pacific excluding China, Middle East & Africa and China. What is the revenue potential of dental lasers market across regions of North America and Europe? Who are the key competitors and what are their portfolios in dental lasers market? What are major challenges influencing the growth of dental lasers market? How intervention from regulatory authority is shaping the dental lasers market growth? The dental lasers market has been estimated based on supply-demand approach. The market was first calculated based on incidence and diagnosis rate, conducted in different region/countries. Other qualitative factors analyzed during the estimation include treatment rates for dental lasers, recurrence rate and others. This information is further validated with rigorous primary research (including interviews, surveys, in-person interactions, and viewpoints of seasoned analysts) and secondary research (including verified paid sources, authentic trade journals, and resourceful databases). The research study on dental lasers market also includes top trends and macro as well as micro economic factors shaping the dental lasers market. With this approach, the report on dental lasers market anticipates the industry attractiveness of every major segment in dental lasers over the forecast period.